Everest Base Camp Trek in March Doable? Home / 10 Best Treks in Nepal – The Ultimate Guide for Trekking in Nepal / Everest Base Camp Trek in 2018: The Ultimate Guide / Everest Base Camp Trek in March Doable? The winter is left behind and the sun is welcome. This is how March comes in light. This fabulous month of the year brings about the joy of the most profound kind to trek in the Everest region. Thinly populated and the air of spring in the sights. And if you have to think of one of the best times for trekking to Everest Base Camp, think of the joyous month of March. Everest is located at the highest altitude there is on earth. This results in very cold climatic conditions during the winters. Cold in Everest region can go way below freezing point. And the same is true for the Base Camp where the lower end of the temperature can go as -20 degrees. March provides comfort because of the warm climate. The trees start to blossom and so does the overall mood of the people who come to trek as well as serve you on your way. The days also start to get longer in March which means that you will have a lot of time to enjoy and capture the memories you make along your trek in March. There is no need to fear the monsoons as they are not on yet. And you don’t have to worry about the trekking traffic as this is not the most popular of the seasons. 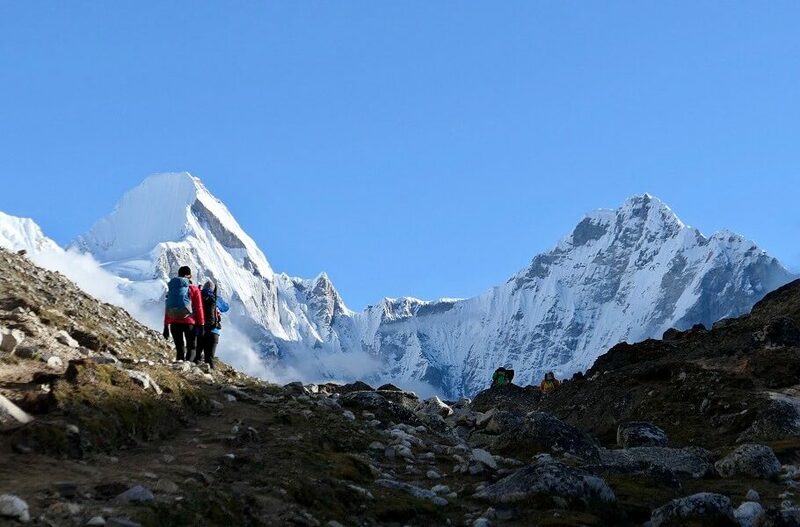 With so many exciting prospects of trekking to Everest Base Camp in March, it comes as a surprise to people why this month is not as popular as some other months. The spring in Nepal, which falls in the month of March-May, is known as the Basanta Ritu. Basanta Ritu is considered to be a romantic season as it is easy and pleasing on the souls and is lush green in texture. The air is not as moist as in other months. The low amount of water in the air means that the chances of formation of clouds are really low and thus the chances of rain are also minimum. The flights that you will have to catch, to and from Lukla, will also have lower rates of cancellation. This means that you can forget spending more number of days waiting to catch a flight or dealing with the haggle of delay. What makes the mountains, and that includes Everest (Base Camp), unpredictable is that there is a great difference in the daytime and nighttime temperature. The wind also plays a significant role in determining how cold or hot the temperature gets. Besides, as you go higher up, the lower the temperatures are expected to get. The climatic conditions at the Luka airport and Namche Bazaar, which are at an altitude of 2800 meters and 3400 meters are warmer than that of Base Camp. The average daytime temperature is around 12-15 degrees in the daytime. In the nighttime, it can be anywhere between 5 degrees to -10 degrees. It depends upon whether you are staying inside the comfort of your hotel/ teahouse or are camping outside. Holi, the festival of colors of Nepal, generally falls in the month of March. It is a good way of socializing with Nepalese as this festival brings about interaction with people across various communities. The pleasant weather condition with least chances of cloud covering makes the trek in this month a dream. The lakes in the Everest region are wonderful to view and reveal all the majesty in color and depth in the month of March. Flights that are affordable and easy to secure. This will also reduce the amount of time you have to wait to get a booking from Lukla to Kathmandu or Kathmandu to Lukla. Besides the conventional trekking routes of going to the Everest Base Camp and crossing the mountain passes, you can also go for a helicopter trek or a helicopter tour to the Everest Base Camp to greatly reduce the amount of time you spend in your trip to this region. The views of the various mountains and mountain passes are gorgeous to view. This rule applies for all the months that you will trek in the Everest region. Stamina and strength will dictate if you will complete your trek or how high you can go on the trek. Proper training and preparation require you to have completed at least a few hikes in altitudes that are higher than the sea level. It is also necessary that you have prepared for treks that are long because trekking to Everest Base Camp will take close to two weeks. Most trekkers prepare at least a few months in advance to increase endurance and strength of the shoulder, back as well as leg muscles. A true reflection of your body is a reflection of your diet. The better you eat, the better the shape of your body is going to be. And don’t discount the amount of water that is necessary for your body for good bodily functions. While trekking you should not keep your stomach even half empty. You should constantly consume items that are high in protein and carbohydrate. Keep your mouth wet by ensuring that you carry a water bottle with you at all times. You might feel that you are very strong and will able to complete the trek anyhow. But you never know when altitude sickness will catch you. Besides, if you get travel insurance with a travel company, they will provide you with all the necessary medication in case you get struck with altitude sickness. You will also be rescued in a helicopter. If you have never trekked before in the Everest region, you should hire a professional guide. If you explore all the options available to you, you will find the guide that you will be comfortable with. A porter decreases the strain in your body and in the case of medical emergencies will provide much-needed relief. In March when there are not a lot of people in the trekking region, a guide will be a safe bet to not get lost in the trails and they will help you avoid dangerous places that might exist. If The classic Everest Base Camp trek in March might not be doable due to the lack of time, Everest Panorama trek provides a good alternative. In 11 days of the Panorama trek, you will get familiar with the places and culture of the Everest region. Lukla, Phakding, Namche Bazaar as well as Tengboche are the places that you will go to in this trek. Mt. Everest, Mt. Lhotse, Mt. Thamserku, and Mt. Amadablam will also be visible in this trek. Gokyo Everest Base Camp trek is the one you should look forward to if you have around 19 days to spend in the Everest region. The view the mountains as well as the glorious water resources, lifestyle, religion as well as culture of the Everest region will be on splendid display. Gokyo valley. Gokyo Ri, Chola pass, Khumbu icefall and glacier are the places whose impressive views you should look forward to in this trek. The safest and the simplest way to get to the Everest and get its wonderful views is the Everest Base Camp helicopter tour. Within a day, you’ll go to Everest, spend time in the mountains and get back to your place. You will go to the Base Camp and Kala Pathar and have a splendid breakfast in the Everest View Hotel. Although the number of people who do the March trek in the Everest region, there is no reason to worry. In fact, if you talk to people who have trekked in the Everest region for a number of times, they will tell you that there is no season like March to trek. So take a look at the things mentioned above and start your preparations for the Everest Base Camp trek in March. The beautiful mountains, the clear and blue skies, the various festivals and cultures and the awesome weather of the Everest region in March is waiting for you.